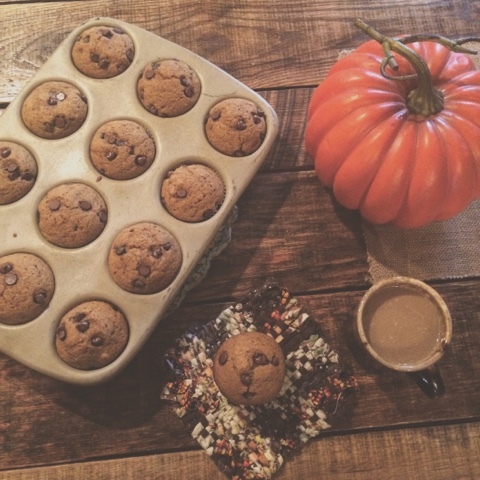 This morning I baked my family a batch of pumpkin chocolate chip muffins. They are SO, so, sooooooo good. Definitely a family favorite. I love the flavors of pumpkin and spice so when September rolls around, I tend to think about that often and end up making recipes that show my love! Begin by mixing the eggs with the sugar. Once the eggs are incorporated, add your pumpkin and mix well. Add oil. I allowed this to mix in my kitchenaid while I put together the dry ingredients. Add all dry ingredients together and mix thoroughly. Add dry to wet a bit at a time and let it get combined, but don't over mix. Add chocolate chips, reserving a few for dotting the tops of your muffins. 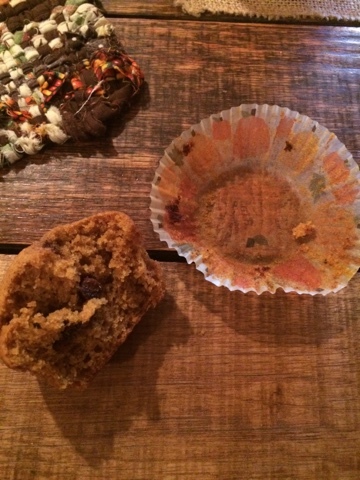 I used cupcake liners for my muffins. I also greased the tops of the muffin pans for that muffin top to release easily. You will love the soft, moist muffin this recipe produces.